When speaking of the economical and social relations in Europe in the early Middle Ages, one must mention the economical and social relations of the two contemporary superpowers; Frankish and Byzantine Empires. 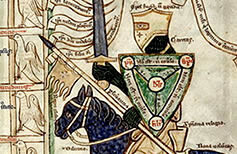 Frankish feudalism, which is about to be discussed further in this article, peaked during the Carolingian dynasty in the second half of the 8th century. One-hundred-and-fifty-year long rulership of this dynasty has made a major contribution and is absolutely most creditable for the complete build-up of the (western) European feudalism. 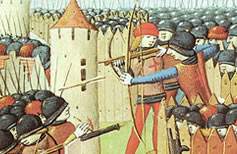 Medieval weapory can be divided into attacking and defensive, and also into cold weapons and firearms. Most popular were cold weapons, although by the end of this period the use of firearms increases, and they subsequently supersede the cold weapons. Medieval warriors of noble descent, who fought on a horse, were called knights. They preferred using a sword as a weapon, and seldom spears and axes. They appear in Europe along with feudalism, and the period they were most active in was between the 11th and 13th century. 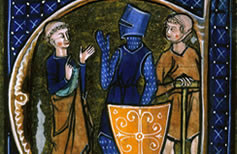 By the end of the Middle Ages, knights are replaced by infantry mercenaries, after gradually losing in significance. 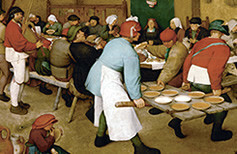 Feudalism represents a social system of rights and obligations whose foundation lies in land ownership and personal relations in which vassals hold land as fief granted by an overlord (senior), while feudal society imposes as a system of organization based on interdependence of people in which the overlords, subordinated to each other, govern the villagers who cultivate the land thus creating them living conditions.